By now you might have noticed I posted dons of Quinoa. Yes I love Quinoa. I am not a big fan of Coconut After starting this blog I started to experiment with different things so wanted to try out coconut Quinoa. Quinoa, If eaten it has slight bitter taste but it was totally unnoticeable in this dish. To my surprise I love this coconut dish. 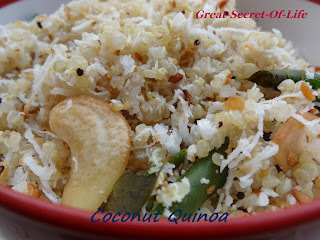 This dish is full of protein and this one of the best combination with Quinoa. Soak Quinoa in water for atleast half an hour, rinse and drain. Add 2 measures of water to 1 measure of Quinoa and salt to taste and cook till it fluffs up. Remove quinoa and let it cool completely. Heat oil, add mustard seeds and once it stops spluttering add asafoetida powder, broken urad dhal, Bengal Gram dhal. chillies, curry leaves. Saute for a minute till the dhal slightly browns. 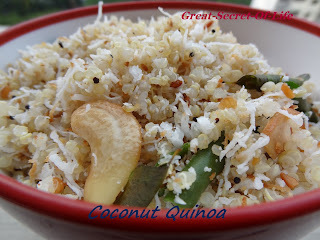 Now add the grated coconut and keep stirring continously for few minutes till the coconut slightly browns evenly. Switch off add Peanut powder, salt and cooked Quinoa and mix thoroughly. Garnish with cashews and Coriander leaves and serve.